In a single century, we have extended human lifespan by 35+ years. At the same time, technology has evolved to the point where we can now communicate instantaneously across oceans, benefit from software which coordinates care and manages health. We have even created robots which sense emotion and even lead group exercises. Not only are we living longer. We are living better! It’s no wonder that technology and innovations that serve our aging communities are such a hot-topic. The Ageing Asia Innovation Forum, hosted this year in Singapore, brings-together professionals, inventors, and problem solvers from all over the world. During this meeting, they had the opportunity to sample a new line of food products: Health Food Matters. The founder, Grace Gan, calls it a functional food product because it is intended for people who have feeding issues. Gregorian was one of the few environmental gerontologists in attendance at these meetings. By and large, the Forum brings designers, inventors, and product-developers together. On exhibit was a plethora of products and designs meant to make life more comfortable, and nutritious for people with feeding issues. In other words, people who need help feeding themselves, or who need to be fed. 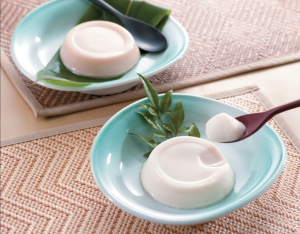 Grace Gan, a native Singaporean, developed this line of functional food products in response to the older people in her own family. The product line is called Health Food Matters, with the subtitle, “Restoring the Joy of Eating.” It is steadily gaining popularity across Singapore, perhaps because it does make eating a more joyous and dignified experience for consumers – and their caregivers. The original market for Health Food Matters was older adults, and people living with a disability. Gan at first marketed exclusively to care centers and retirement residences across Singapore. Gan, a speech therapist by training, had spent a lot of time working with patients in Singapore’s care-centers. She was frequently present when meals were served, and she noticed that food-preparation, serving and eating were fraught with stress and tension. Even more important, Gan noticed that feeding was as stressful for the caregivers and wait staff, as it was for patients who were being fed. It is familiar that the sense of taste begins to dull as people grow older, affecting the ability to taste, smell and savor food. This is true even for people aging-in-place at home, where there is more control over what is on the menu, and how it has been prepared. In care settings, the dulling of taste buds is compounded by loss of control over menu, and dining conditions. To compound matters, many older adults in institutional care live with neurocognitive disorders that cause dysphagia, a nutritional disorder characterized by difficulty swallowing, malnutrition and dehydration. Malnutrition and dehydration, in turn, contributes to other conditions such as bed sores, infection and hypoglycemia. When Grace Gan visited Singapore’s care centers, she noticed that it was common practice to thicken food with milk supplements. The idea was that this would make institutional food more nutritious and more palatable. But, in fact, Gan believed that the result was neither nutritious, nor palatable. Milk supplements did not typically enhance appetite, or contribute to better health. Gan developed Health Food Matters as a way to enhance appetite by making its functional food line taste more like familiar food, and have what professionals call, the “Mouth Feel” of eating familiar food. In taste and texture, Health Food Matters has the taste and “Mouth Feel” of familiar food, but is much softer, and easier to eat. Products range from porridges, side dishes, snacks and desserts to condiments and thickeners with a variety of flavors that serve different functions. As an alternative to thickened fluids, apple ENA-charge fruit jelly for instance, supplement fiber while apricot fruit jelly supplement zinc and iron. Calcium sprinkles can be added to porridges or side dishes providing flavor, color, and extra vitamins which combat low appetite and malnutrition. In addition to keeping patients in mind when developing functional food products, Health Food Matters has benefits for caregivers. Most important, it relieves them of many meal-related burdens: chopping and cutting food, feeding patients or assisting them when they feed themselves, and the perpetual chore of cleaning-up. Portions tend to be small, but are densely packed with extra nutrients, proteins and calories. This achieves nutritional goals for patients, and gives caregivers an unexpected bonus. The Health Food Matters philosophy also harmonizes with Singapore’s efficiency-driven culture: Mealtime becomes more “Efficient.” Less food is wasted, and less time is spent coaxing patients to eat. This resonates with local nutritionists and caregivers because Singapore is a culture which strives for efficiency. One reason for the efficiency, is that this product-line is easily prepared. Caregivers simply submerge prepackaged food bundles in heated water. Nurses and care staff can focus on caring for residents rather than worrying about the viscosity and portion-size. Products range from porridges, side dishes, snacks and desserts, to condiments and thickeners with a variety of flavors that serve different functions. As an alternative to thickened fluids, apple ENA-charge fruit jelly for instance, supplement fiber while apricot fruit jelly supplement zinc and iron. Calcium Sprinkles, another of Gan’s innovative products, can be sprinkled over porridges or side dishes to enhance flavor, color, and nutritional value. Caregivers tell Gan that the Calcium Sprinkles also make food look more festive and inviting. Grace Gan believes that Health Food Matters will eventually be a welcome alternative to forced-feeding. Thanks to this Singapore-based product, older people all over the world can one day look forward to enjoyable dining, in the company of family or friends. Even now, local care facilities in Singapore residents report improved health outcomes when they serve Health Care Matters, Inc. to patients and/or residents. Caregivers also report minimal food wastage and easier clean up. Residents enjoy Health Food Matters, Inc. that they often clean their plates. Above all, Health Food Matters makes mealtime into dining once again. Health Food Matters restores dignity to breakfast, lunch, and dinner in long-term care facilities. Eating can and should be a social experience, something which is true everywhere from Singapore to Seattle. Singapore is considered to be a leader in applying cutting-edge, sustainable, technology to geriatrics. Technology-based interventions, such as robotics, are already making long-term care facilities more efficient. Health Food Matters may be doing this for meals and mealtime in long-term care. Singapore is a world leader in developing and applying technology to geriatrics. Health Food Matters has been proven to make mealtime a more efficient experience. It may well be that this product-line can also make mealtime a more spiritual and social experience. For older people and people with disabilities. That would be the proverbial icing on the cake!